Three balls in roatation, a pretty little shot you can have fun with and it is also easy to set up. 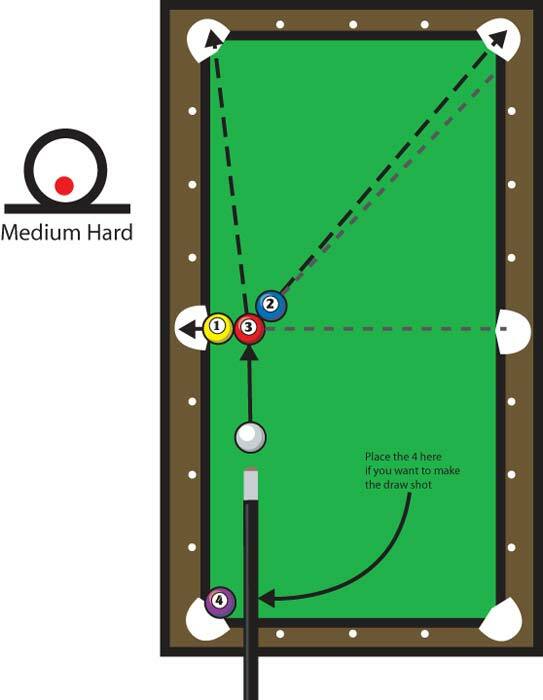 Freeze the 1 and 3 ball in the left side pocket with their axis dead in the center of the right side pocket. Tap these two balls gently. Freeze the 2 against the 3 aiming it to a point on the right side of the rail as indicated. Position ‘old snow’ in line with the three and hit the 3 right in the nose with a little bottom to stop ‘whitey’. If you have confidence in your draw stroke, you can place the 4 ball in the corner near your cue and make it with the ‘rock’.